FREE Piece of Clothing at Sears Outlet Stores Today! 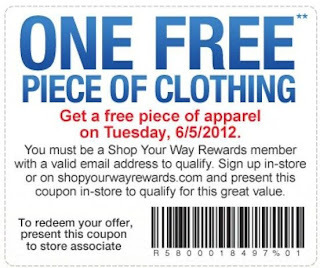 Get one FREE piece of apparel at Sears Outlet Stores today, 6/5/12, with this coupon! All you have to do is sign up to be a Shop Your Way Rewards member in-store or online and you can get any piece of clothing for free at a Sears Outlet store that carries apparel. Note: If you are not a Shop Your Way Rewards member, you can sign up here. Also, use this locator to see if there are any participating stores near you.